An easily transportable way to enjoy the delicious the flavors of dulche de lech with just a few slight variations to the dulche de leche recipe. 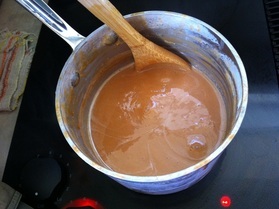 Dulce de leche slowly being mixed with a wooden spoon while cooking on the stove. Prepare two cookie sheets covered in wax paper or parchment paper. In a medium sauce pan over medium heat, dissolve the cornstarch and baking soda in 1 cup of milk and using a wooden spoon, stir carefully to dissolve any lumps. Add the remaining milk and sugar into the sauce pan. Insert a candy thermometer. Bring the mixture to a boil. Continue to stir constantly until the candy coats the back of the spoon. At this point being to cook to a temperature of 150 degrees. Periodically drop the candy in single teaspoonful amounts onto the cookie sheets to test hardness. Continue cooking and allowing the temperature to increase until the liquid begins to harden once it hits the paper. However, do not allow the mixture to scald or become grainy. Once the candy begins to set, immediately remove the candy from the heat and quickly drop by teaspoonfuls onto the prepared baking sheets. Allow the candy to sit until it's hardened, then remove and store by either wrapping the candies individually or place them in layers with the non-stick paper separating the layers.